The annual Dave Schultz Memorial International begins Thursday at the US Olympic Training Center in Colorado Springs. On the Greco side of things, it is not quite an “international” event, as only a handful of foreign athletes have registered to compete. That does not diminish the importance of the tournament, however, especially since it represents the first competitive opportunity for most US Seniors this season. Many of the Schultz’s domestic participants have already been in Colorado Springs due to the January National Team camp, which began last week and wraps up tomorrow. Over the same time period in Boise, Idaho, 2018 World Teamers Jesse Thielke (63 kg, NYAC/LOG, world no. 14), RaVaughn Perkins (NYAC, world no. 17 at 72 kg), Kamal Bey (77 kg, Sunkist, world no. 7), and Patrick Martinez (87 kg, NYAC) all received training under former NMU/USOEC head coach Ivan Ivanov at his Suples facility. Former Suples athlete and current National Team member Hayden Tuma (67 kg, Army/WCAP) was also in attendance. Below is the (fluid) entry list for the Dave Schultz Memorial (streaming live on FLOWrestling). Weights may be subject to change — but you will notice that Patrick Smith (Minnesota Storm) and Perkins both appear in the 77-kilogram bracket. Smith went 77 in three European events towards the end of the fall, coming away with two bronze and a silver. Perkins’ most recent showing at 77 came at the last Dave Schultz Memorial in November of 2017, where he fell in the finals to Olympic/World champ Kim Hyeon-Woo (KOR, world no. 3). There is still one more edition of the 2019 Watchlist series left to go, but have you been doing your homework thus far? Eight of the ten weight classes feature at least two athletes previously discussed. Notes: this is not the final entry list — Army/WCAP athletes had not been officially registered for the tournament as of press time and are displayed below with an asterisk. In addition, the roster may be updated to include new entries, even though some weight class previews may not reflect their presence in a bracket. Not high in numbers at the moment, but a U23 Trials final rematch between Dalton Duffield (NMU/OTS) and Jabari Moody (NYAC) could be in the cards. It’s also important to see how Sean Sesnan (WBC) has progressed and what Jemone Carter (Marines) has to offer. 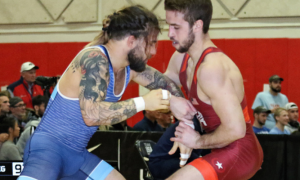 If 60 were to stay this way and only deliver a four-man bracket, you’d still be getting your money’s worth by catching the latest showdown between Dalton Roberts (NYAC/OTS) and Randon Miranda (NYAC/OTS). But — Ildar Hafizov (Army/WCAP) lurks in the shadows, though as mentioned, his name is not officially entered at this time. Right off the bat, you’ve got Thielke, 2014 University bronze Sammy Jones (NYAC/OTS), and 2018 Junior World Team member Alston Nutter (Sunkist/OTS). Throw in a constantly-improving Colton Rasche (Marines) and you have the recipe for some terrific match-ups. 67 is where the participation starts to expand. 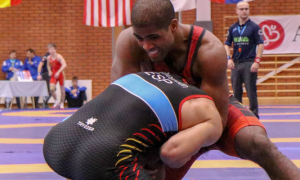 10 athletes (as of today) are involved, including National Team beast Hayden Tuma (Army/WCAP) and former University World bronze Jamel Johnson (Marines), who earned three overseas medals in ’18. Egypt’s Mostafa Mohamed, fresh off an appearance in Budapest, figures to be a factor once again. 2018 US Open runner-up Jessy Williams (NYAC/FLWC) and Junior Trials champ “Mr. Fantastic” Benji Peak (Sunkist/OTS) — as well as up-and-coming assassin Riley Briggs (NMU/OTS) — pile on what should be an excessively entertaining bracket to watch. Colin Schubert (NYAC/OTS), Anthony Linares (NYAC/LOG), and the fiercest dog in the yard, Britton Holmes (NMU/OTS), automatically elevate 72’s standing in this event. Austin Morrow (NYAC/OTS) is going to be targeted for 67 come the US Open, but he’s checking in for Schultz up a weight class and immediately becomes a favorite. Lenny Merkin (NJRTC) zips right in as the wildcard due to his can’t-miss all-around ability and penchant for scoring. Undercover, this is a monstrous weight class. Do you like seeing points put up on the board? That’s what you’re going to get with 72 at the Schultz. And here it is, 77 kilos, the most talent-rich weight class in the country. As noted in the intro, both Smith and Perkins are (reportedly) here, but they’re hardly alone. Two-time U23 World Team member Jesse Porter (NYAC/OTS), Junior Trials runner-up Josh Anderson (NMU/OTS), 2017 Military World Team member Brandon Mueller (Air Force/WCAP) and Storm standout Alec Ortiz are all making their 2018-19 season debuts at the Schultz. Smith and Perkins might be the lead story, but their supporting cast will have a say in how it ends. Two-time World Team member Cheney Haight‘s (NYAC) first appearance at the Dave Schultz Memorial came way back in 2006. He’s taken second a couple times, but has never won the thing, as crazy as that sounds. WIll he finally get over the hump this year? If he does, expect the duo of 2018 U23 World Teamer Carter Nielsen (NMU/OTS) and Marine Terrence Zaleski to potentially provide his stiffest tests. Then again, Spencer Woods (NYAC/OTS), who has made huge strides recently and demonstrates a nice, fiery approach, demands attention. John Kent (Gator) and Corey Fitzgerald (NMU/OTS) might not carry the same fanfare as the others, but both should certainly have a moment or two in this tournament. With the exception of two-time Olympian Ben Provisor (NYAC/NLWC), they’re all involved. Eight World Championship appearances spread across different age-groups can be found in what is unquestionably the United States’ deepest field. 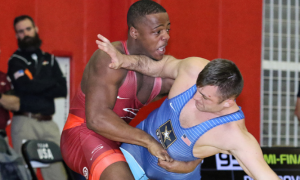 Patrick Martinez (NYAC), Joe Rau (TMWC/Chicago RTC), and a returning Jon Anderson (Army/WCAP) are the headline-grabbers, but National Team member Kevin Radford (Sunkist) and Barrett Stanghill (Minnesota Storm/OTS) are both just about done taking a backseat to anyone in this weight. Watch closely: although it’s way too early to take much away from how this tournament shakes out, that doesn’t mean a tone can’t be set for the remainder of the season. National Team member Lucas Sheridan (Army/WCAP) will rightfully have a big target on his back, but that’s not a surprise at this juncture. Sheridan at 97 was a revelation last year, and should be in line for an even stronger 2019. Former Junior World Team member Kevin Beazeley (NYAC) swooped back into the mix last spring. He qualified for the Trials in Italy and ultimately finished third in the challenge tournament. He also just won a freestyle event in Canada — but he’s on the Greco entry list, and as such, becomes a major candidate to stand on the podium. “Big” Nick Boykin (Sunkist) is growing his toolset — and growing acclimated to this weight, while Eric Twohey (Minnesota Storm) spends his downtime during medical school by displaying glimpses of natural ability that are impossible to ignore. Plus, he recently earned his first international medal, and on a part-time schedule, to boot. But it is Roy Nash (NMU/OTS) who could steal the show. A Junior World Teamer back in 2013, Nash returned to the sport last year and made an immediate impact. Big, strong, and hungry for improvement, you’d be smart to hone in on how he does at this thing. The bad news: as of now, only Trent Osnes (Marines) and 2016 Olympian/multi-time World Team member Robby Smith (NYAC/Chicago RTC) are registered — and Smith has just confirmed he actually will not be competing. Now for the good news: both WCAP star heavyweights — Toby Erickson and Jacob Mitchell — are expected to show up. Erickson won this event back in ’16 and finished third last November. The story, oddly enough, begins on Facebook. This past Saturday, we released the 2019 Watchlist for 82-87 kilograms, a long, detailed scouting report of all of the athletes, particularly because of the grand depth present at 87 kilograms. And then someone quite notable decided to interact with the content. 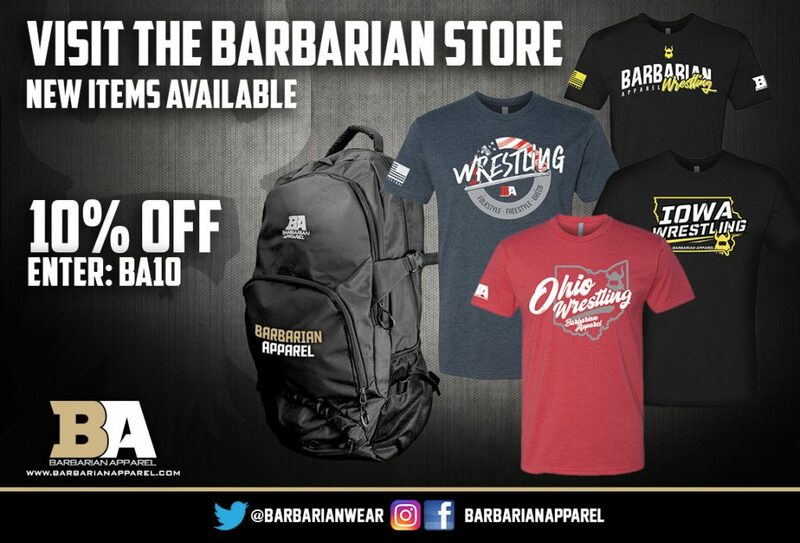 To speed this all up, Jake Clark’s name is now once again Jake Clark (87 kg), as the two-time World Team member and 2016 Olympic Trials finalist confirmed earlier today that he indeed plans on returning to competition later this spring. In fact, Clark will be getting started before the US Open even arrives. An assistant coach at Division III St. John’s in Minnesota, he is set to participate in the school’s collegiate open tournament this coming weekend in effort to get some matches in. For what it’s worth, Clark will be competing at heavyweight this weekend — although he still plans on returning to the much-more familiar territory of 87 kilos for Greco-Roman competition. “Yeah, I’m entering at heavyweight, I’m just hoping Gable Stevenson doesn’t show up or something, I’m not able to defend shots like that,” he laughed. The premier question on the minds of many would likely have to do with his training environment. Formerly a Marine wrestler before later joining up with the Minnesota Storm, Clark is not yet at the stage of his preparation where everything is completely locked in all the way. That’ll change. He is but easing back into the routine as a soon-to-be 39-year-old. 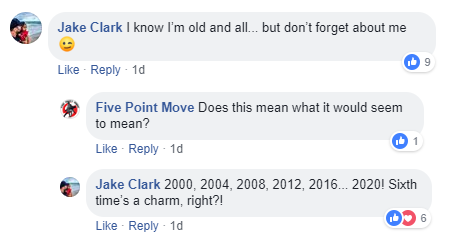 So while you wouldn’t say Clark is totally “piecing it together”, he does acknowledge that the tempo in place has much more to do with remaining mindful of his body’s needs. “Some people might say, Ah, you’ve got to have more than that, but I have a couple of high school studs I train with, guys who are very tough and coming up at my club,” began Clark. “They are a couple of tough guys, big upper-weights. I’m working out with them, but then I am also working out at the college with a couple of guys I throw down with. Iron sharpens iron, but I’m old. I’ve got to cut through some butter every once in a while (laughs). It goes without say, but the addition of Clark to the 87-kilogram field would put it at a behemoth level of competition. Good thing there will be time to talk more about that — a full-length interview with Clark is now on the agenda for next week! Winner of the past two World Championships and a three-timer altogether, Frank Staebler (72 kg, GER, world no. 1) is also a star for the Red Devils in Bundesliga, the professional wrestling league that features both international styles. And it has been a long while since Staebler has lost a match, in either UWW or Bundesliga competition. You’d have to go back to the 2016 Olympics to find the last official loss(es) for the German celebrity, as it was in Rio where he first fell in the quarters to eventual champ Davor Stefanek (67 kg, SRB, world no. 2), and then again in the repechage to Tomohiro Inoue (JPN). That’s over two years of matches, two more World titles, and not one loss. Craziness. If you’re a fan of international Greco, it’s an article well worth your time. The latest episode of The Five Point Move Podcast was released on Saturday. Co-host Dennis Hall is around for the opener, and from then on out it’s a whirlwind. Former National Team member and now-5PM contributor Paul Tellgren pops on to discuss the upcoming Schultz — then it’s Tellgren and 2012 University World Champion Max Nowry (55 kg, Army/WCAP), 2012 Olympian/multi-time World Teamer Ellis Coleman (67 kg, Army/WCAP, world no. 11), and the Minnesota Storm’s Alec Ortiz (77 kg), who will be competing this week. The program is embedded below, as always.